Cotton Craft 12 pack napkins are made from 100% Pure Cotton. The right material for napkins is cotton, not polyester. They are the correct size 20x20, and 38% larger than the standard napkins which are 17x17. The corners are sewn mitered for better shape and structure. The 12 pack set is a great value and perfect for everyday use, parties, events, or to just stock up. 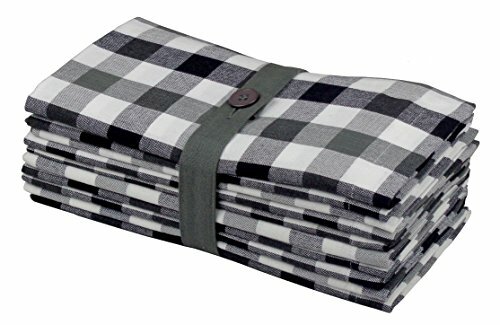 Set contains 1 Dozen Oversized Gingham Check Black Grey- Tailored with Mitered corners and a generous hem. Each napkin measures 20x20. Our napkins outsize the competition whether online or in the best of retail stores. Correctly sewn with Mitered corners the way napkins were sewn the old fashioned way - gives a superior finish to the napkin.